L-com Global Connectivity, a preferred manufacturer of wired and wireless connectivity products, announced today that it has introduced a new line of M12 and M8 connectors, adapters, receptacles and couplers to address harsh environment connectivity applications. These new products are designed for industrial control and factory automation, test equipment, I/O connectivity, sensors and actuators, or any straight wired connectivity application where a screw down interface is necessary. The new products consist of M12 and M8 3, 4 and 5-position field termination connectors, M12 and M8 4 and 5-position female adapters, M12 male and female receptacles and a series of M12 female T-couplers. “These new M12 and M8 connectors, adapters, couplers and receptacles were designed to address straight wire connectivity applications where a rugged M12 or M8 interface is required. These new products boast a wide operating temperature range and are IP67-rated ensuring flawless connectivity even in extreme environments,” said Dustin Guttadauro, Product Manager. 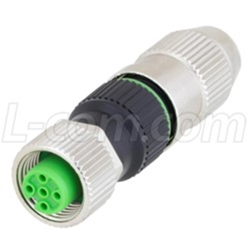 L-com’s new M12 and M8 connectors, adapters, couplers and receptacles are in stock and available for immediate shipment.